Aramaic, like a son of the gods. The scriptures do not tell us what time of day this story occurs. As with the previous cartoon, I have made it early evening, with a darkening sky, in order to make the lighting of the scene more dramatic. The flames form the furnace provide the main light source for this scene. 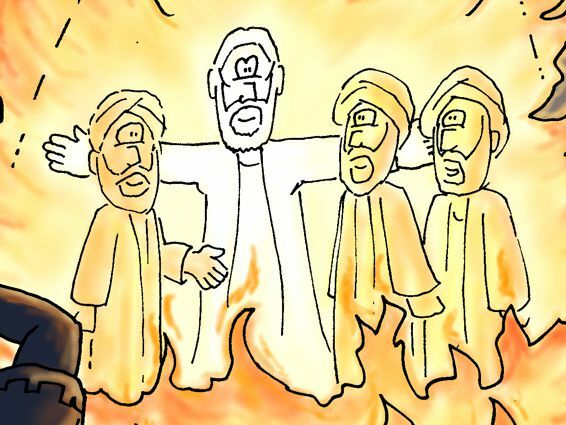 King Nebuchadnezzar is on the right of the cartoon, with 2 guards on the left. Notice they have their hands up to shield themselves from the intense heat of the furnace. 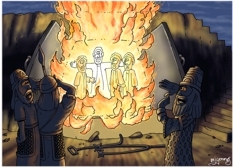 The 3 Hebrew men Hananiah, Mishael, and Azariah (who were renamed by their Babylonian captors: Shadrach, Meshach, and Abednego) can be seen with the mysterious fourth figure, in the fire of the furnace. 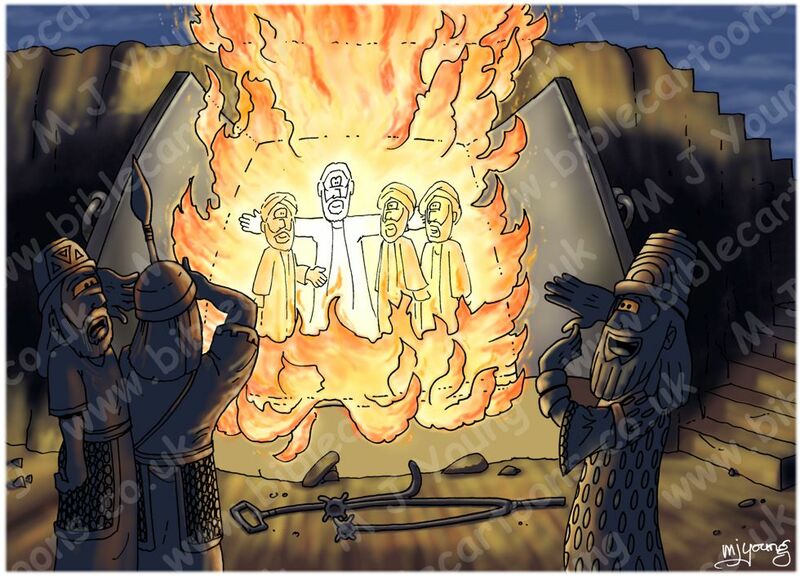 As I stated in the previous cartoon, the fiery furnace of this story could have been a brick kiln, or an open topped blast furnace. I have elected to show the latter. This type of furnace would be in constant use, since the Babylonians disposed of their dead by cremation. In then previous cartoon the action takes place on the top of the furnace, but this is a short time later. We see that King Nebuchadnezzar has rapidly decended the steps that laed from the top of the furnace, to it’s open side. I decided to have 2 huge doors in the side of the furnce, which would allow access. 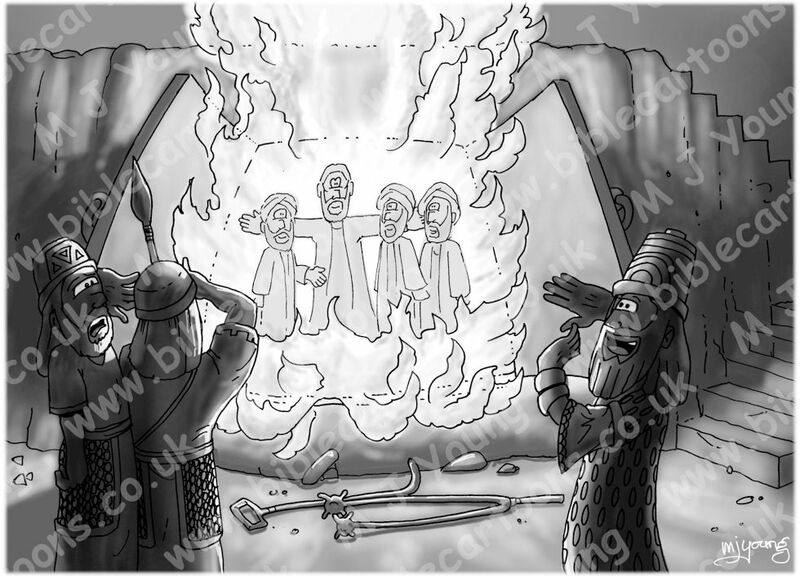 The 3 Hebrew men & the fourth figure can be seen in the flames at the centre of the furnace. Here’s a close-up of the “4th man”.